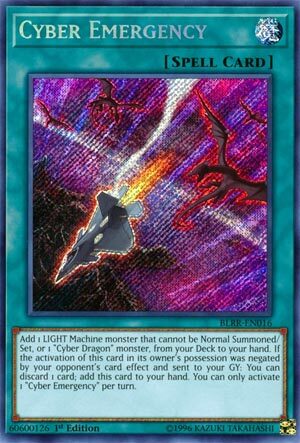 Add 1 LIGHT Machine monster that cannot be Normal Summoned/Set, or 1 “Cyber Dragon” monster, from your Deck to your hand. If the activation of this card in its owner’s possession was negated by your opponent’s card effect and sent to your GY: You can discard 1 card; add this card to your hand. You can only activate 1 “Cyber Emergency” per turn. Cyber Emergency starts off another Cyber week at Pojo. Normal Spell searcher that can net you a “Cyber Dragon” monster is a good card for the archetype, but the addition to the search to get a monster that can’t be Normal Summoned/Set gives you added flare for your search. Many of the monsters searched by that second option are “Cyber Dragon” based, but there are cards like D.D. Jet Iron that can be searched by this effect. You’ll use this to search a “Cyber Dragon” though. Cyber Emergency’s ability to get itself back to the hand if negated is important for an archetype that doesn’t sport many searching spells. 1-for-1 trade off an opponent’s negation of Cyber Emergency is worth it to get to what you need. Cyber Emergency is a simple Normal Spell Card with no cost that adds any Cyber Dragon monster to your hand. If the activation is negated you can discard a card and try again. You can also search any Light Machine Monster instead of a Cyber Dragon monster if you want, so this card might have more future versatility down the line. As such it is definitely worth owning three and using them in Cyber Dragon decks or something else that’s Light and Machine. Happy Monday! Score: 4/5 Art: 1/5 Gradius flies in space, no branches. I went ahead and chose the cards this week and with Cybernetic Horizon giving us more Cyber Dragon support, I decided to go with a Cyber Dragon week. Despite getting new support in Cybernetic Horizon, I decided to start with a support card from the Battles of Legend: Relentless Revenge set, Cyber Emergency. Cyber Emergency is a Normal Spell that can search for any LIGHT Machine that cannot be Normal Summoned or Set or a Cyber Dragon monster from your deck to your hand. For the LIGHT Machines that cannot be Normal Summoned or Set, there are seven options but Cyber Eltanin is the only good one out of those. There are many Cyber Dragon monsters, however, that are worth searching from the original Cyber Dragon to Core, Herz, Drei, and (assuming we get it) Nachster. This helps get you something to start a potential Cyber Dragon play. If this card was negated by an opponent’s card effect and sent to the GY, you can discard a card to add this back to your hand, so it is nice to get it back when it is negated. Sadly Ash Blossom doesn’t negate the activation I believe. You can only activate one Cyber Emergency per turn, but if I’m right, when the activation is negated and you do add it back, you can use it again. Cyber Emergency is a great searcher for the archetype, topping Cyber Repair Plant, which is still worth running for another searcher. Art: 3.5/5 I honestly don’t understand what the artwork is supposed to be, but doesn’t mean I hate it. Looks like it’s a Cyber Dragon support week. Kicking things off is a Normal Magic card, Cyber Emergency. An excellent searcher, letting you add a Cyber Dragon Monster from your Deck to your Hand (or a Light/Machine Monster) so long as it can’t be Normal Summoned or Set. The Cyber Dragon family is bigger these days than upon its release back in the Cybernetic Revolution day, so that’s good. Additionally, it has a recycle effect, that if this card has its activation negated by an opponent’s card effect, and sent to the Graveyard, you can discard a card to add it back to your Hand. You can only activate one per turn, but if the activation is negated, I’m under the assumption that counts as not having happened, so you should be able to activate it again, if you bring it back, no? Art: 3.5/5 That looks like a jet or spaceship of sorts to me. The sky is very chaotic looking, but I”m not sure the picture is fitting the card name. Next articleNew Dawn – MTG Core Sets Are Back!